Marcus Allbäck is one of the most skilled Swedish forwards of all time. For many years, Allbäck played at a very high level in some of Europe’s biggest leagues, and he participated in several tournaments. Self-training is one of the reasons he was so successful. Now he’s sharing his experiences with us. Sweden has delivered heaps of world-class forwards over the years. The next big star could be AIK Stockholm’s 17 year old Alexander Isak but for now it’s Zlatan Ibrahimovic who makes the headlines. The Swedish superstar’s name is almost synonymous with Swedish football itself, but there was also a time before him. Back then it was Henrik “Henke” Larsson who scored goals in large numbers, first for Celtic, then with FC Barcelona. But there’s a Swede who has represented Sweden in more countries than Larsson has, and who put Swedish football on the world map, and that’s the now retired Marcus Allbäck. The former Swedish national team player represented Sweden in his final international tournament in 2008, when he traveled to the Euros in Austria and Switzerland with his team. His career was coming to an end, but oh, what a career he had. It didn’t take him to Barcelona, like Henke’s, or Juventus, Manchester United, or PSG, as is the case with Zlatan’s career, but it gave him a chance to prove Sweden’s capability for producing efficient sharpshooters. With two stints in Danish football, one in the Netherlands, one in Germany, one in England and one in Italy, the now 43-year-old Swede is a well-traveled man. At Örgryte IS (in Sweden) he got his early schooling, and at the Dutch SC Heerenveen and the Danish FC Copenhagen Allbäck developed his talent to the fullest. He scored countless goals, but if not for the self-training in addition to his club practices, he probably wouldn’t have done so. The Swede is therefore certain that self-training is a necessity if you want to make it to the top in football. –Self-training, in my view, is an incredibly important part of success. I don’t think anyone has made it to a high level without self-training, he explains without specifying how much effort you should put into it; that depends on oneself and one’s level of ambition. It’s important to find a good balance. For example, if one has many practices with the club, it’s also important to rest and give the body a break. I recommend doing self-training after normal training, and also once in a while on days when you don’t have club practice. I think it’s important to train both what you’re already good at and the techniques you need to improve. To me, self-training is something you start at a young age and continue doing throughout your career. The exercises and situations will change with time, but it’s all about what you want to be able to do with a football. You get to decide how much you want to train and how good you want to become. There are no shortcuts. It’s hard work. 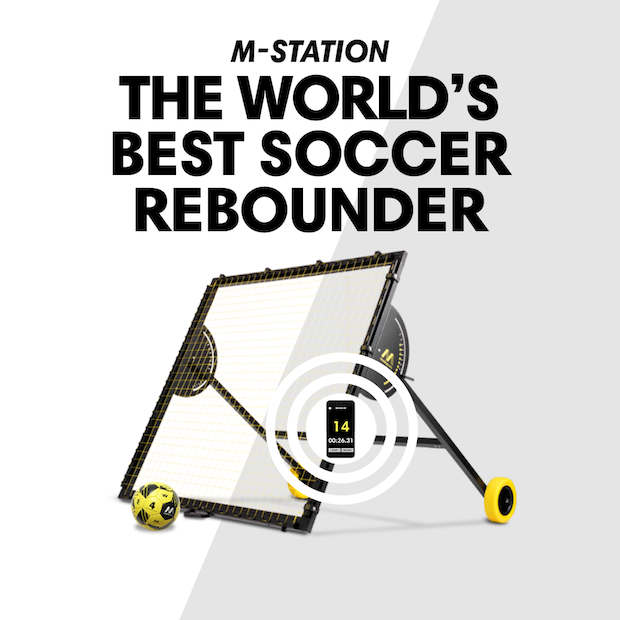 No matter where you live, you can make use of a training tool, such as the m-station football rebounder from Munin Sports. And the m-station is a training tool the Swede is quite enthusiastic about. -I own an m-station, but it’s mostly my son, Rasmus, who uses it. Sometimes we use it together, and we’ll try to hit it with a good strike so we can volley the ball towards the goal. It’s very obvious to me that Rasmus is getting better. I would recommend the m-station. It’s really top notch. “m-station-time” with Marcus Allbäck and his son! The seasoned Swede would often train game-specific moves, and not only as a young player; he did so all the way through his 21-year career. –I was a forward, and I wanted to prepare for situations that I felt would emerge in matches. For example, I practiced volleys all the time, and with both feet, not so far from the goal—quite close, actually. I just focused on kicking the ball perfectly with the left and right foot. To get more out of self-training, it’s a good idea to include teammates. That’s what the Swede did in the Netherlands, where he played for SC Heerenveen. -I have an example from my time in the Netherlands: We had a Finnish national team player, Mika Nurmela. He played on the right wing, and he would make some fantastic crosses, so after training the two of us and a goalkeeper would stay on the field and practice attacks. I would make a pass to Mika from outside the box, Mika would run to the sideline and make a cross that I would try to score off of, and the keeper would try to protect the goal, which of course was very difficult since I was the one shooting towards goal, Allbäck says with a grin, and goes on: But in that way, all three of us got some practice. Self-training with teammates paid off for Allbäck. He scored 25 goals over two seasons, and with an average of about one goal for every two matches, he secured a move to Aston Villa in the English Premier League. With enough practice and hard work, you can also find great success; all you have to do is get down to it and take the initiative to self-train. One way to get started is to talk about self-training with someone on your team. –Talk to a teammate and try to find an exercise that both of you think is fun. Or talk to an assistant coach or another leader on the team and find out if they might be able to help you out. You must figure out on your own how to effectively self-train and perform exercises—it all depends on how good you want to be. You can find so much inspiration on the Internet today. The most important thing is that you find something that interests you, and that you feel will make you a better football player. Marcus Allbäck represented Sweden for 9 years. In those years he had 74 national team appearances and scored 30 goals for the national team. Since then, he has been an assistant coach for the Swedish national team. In 2007, he scored 11 Superliga goals for FC Copenhagen in a golden season for the Danish club. He helped his team secure “The Double” and find great success in Europe, where they beat Manchester United 1-0 in a tough match in Parken Stadium—a match in which Allbäck scored the winning goal.